Do you have a blog, particularly a book blog? Time to tune it up and get energized by participating in the Winter 2017 Mini Bloggiesta running from January 13-15. 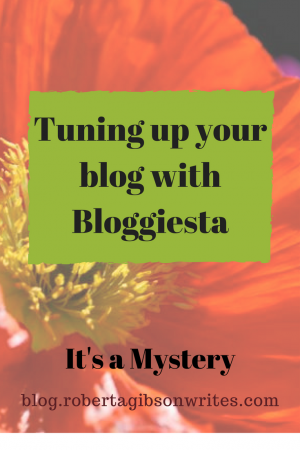 Bloggiesta is a wonderful blog party where you can get your blog organized, take challenges to learn new things and, best of all, meet awesome new bloggers. If you’d like to sign up to participate in this Bloggiesta event, make a to-do list/landing page like this one and then add the link to your post to the Bloggiesta sign-up page. Be sure to look for the Twitter Chat tomorrow (Saturday Jan 14). I’m bummed because I’m going to be in a writing workshop and won’t be able to attend live. Look into the new features of the latest WordPress system and try to incorporate at least one into my website. Prepare a round-up post for Sunday. I’ve been neglecting those. Investigate a new theme for my Wrapped In Foil Blog (children’s book reviews). It’s needs an updated look. Any suggestions? Check out the mini challenges from previous years for even more ideas. Time to get busy. Hope you all have a fun and productive weekend. I have to see what your Wrapped In Foil Bag is….sounds interesting. Have fun, and see you at the Twitter Chat tomorrow. I guess I should have put a link to Wrapped in Foil. It’s where I review children’s books. Enjoy the party! I hope you finish everything you planned to do. Thanks for sharing. Thanks. I hope to get a chance to catch up later today after the workshop. Well, I’d get to my computer much over the weekend, so my list might be the same for the Spring Bloggiesta. great list.. and though I planned to have a separate blog for book reviews (the one I have is an-everything-in-one blog), am guessing I might end up not writing in both of them.. will check out your book lists in both blogs..
I’ve got way too many blogs, but they are all on different topics. I’m not sure I could incorporate them now even if I tried. By the way, I tried very hard to leave a comment on your blog, but the captcha verification went bonkers.